Herndon caught one of two targets for a 16-yard touchdown in Sunday's 24-10 loss to the Bears. Analysis: Herndon made his lone reception count, getting into the end zone for the third consecutive week. 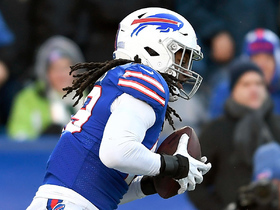 The rookie tight end is starting to work his way onto the redraft league radar, and he should certainly have the attention of keeper- and dynasty-league owners given his recent touchdown binge. He'll look to extend his touchdown streak in Week 9 against the Dolphins. Herndon caught four of seven targets for 42 yards and a touchdown in Sunday's 37-17 loss to the Vikings. Analysis: Herndon's starting to make a name for himself with a touchdown in back-to-back games. He scored from 12 yards out in the first quarter in Week 7, and the rookie tight end should continue to see heavy involvement in New York's passing attack with the injury bug biting some of the team's other skill players. Herndon will try to stretch his touchdown streak to three contests against the Bears in Week 8. Herndon caught both of his targets for 56 yards and his first career touchdown in Sunday's 42-34 win over the Colts. Analysis: Herndon struggled with drops earlier this season, but he hauled in both of the balls thrown his way in this one, including a 32-yard score to make it 30-13 soon after halftime. 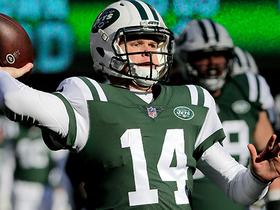 He'll be hoping this performance leads to more attention from fellow rookie Sam Darnold against the Vikings in Week 7. 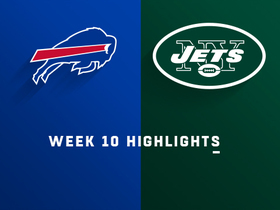 Herndon caught his lone target for 18 yards in Sunday's 31-12 loss to the Jaguars. Analysis: Herndon also watched fellow young tight end Jordan Leggett score New York's only touchdown of the game from two yards out. After getting plenty of hype in camp at a position of need for the Jets, the rookie fourth-rounder has failed to deliver much on the field. Herndon should sink further into obscurity once starter Neal Sterling (concussion) is ready to return, though there's no guarantee that happens in Week 5 against the Broncos. 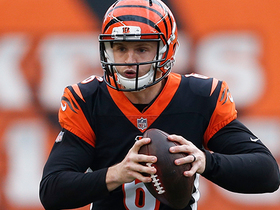 Herndon caught both of his targets for minus-one yard in Thursday's 21-17 loss to the Browns. 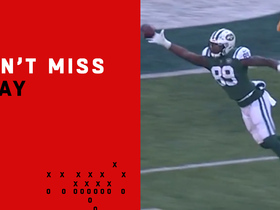 Analysis: Herndon's 34 snaps on 63 offensive plays led Jets tight ends with Neal Sterling (concussion) sidelined, but quarterback Sam Darnold didn't give his fellow rookie any looks downfield after Herndon committed an egregious drop on a deep pass last week. Until Sterling comes back, it doesn't look like New York is going to get anything meaningful out of the TE position. Herndon caught two of four targets for 30 yards in Sunday's 20-12 loss to the Dolphins. Analysis: Herndon got an extended opportunity after Neal Sterling exited with a head injury, and the downgrade at tight end was palpable. The rookie was tackled at Miami's one-yard line on the final play of the first half, then dropped the ball twice in the second half, including on a wide open play that would have resulted in a big gain. This was not a good first impression to make on the coaching staff after failing to catch a ball in Week 1. Herndon wasn't targeted in Monday's 48-17 win in Week 1 at Detroit. Analysis: Believe it or not, there's a silver lining here for Herndon. The rookie's 34 offensive snaps played (out of a possible 60) in this one were second to Neal Sterling's 40, suggesting the coaching staff already views him as the No. 2 option at the position, rather than fourth as the initial depth chart suggested. Herndon has nowhere to go but up after this quiet debut, and it wouldn't be surprising if he eventually supplanted Sterling as the top tight end later in the season. Herndon is listed as the Jets' fourth tight end on the team's initial depth chart of the regular season. 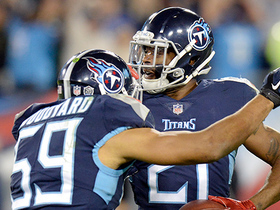 Analysis: This is somewhat surprising given there were murmurs earlier in training camp that the rookie had a legitimate chance to start right away, or at worst, see regular action in two-tight-end sets. While it's probably best to look elsewhere for help at tight end in Week 1, how the coaching staff truly views Herndon will be reflected in his snap count during Monday's game against the Lions. Herndon appears to have won the starting job at tight end, Darryl Slater of NJ.com reports. Analysis: Herndon was held out of Thursday's preseason finale against the Eagles, while Jordan Leggett played through the fourth quarter and caught one of three targets for 18 yards. Eric Tomlinson might also get a crack at the starting job, but Herndon figures to handle most of the pass-catching work. 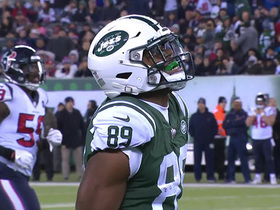 The rookie fourth-round pick provides the Jets with some semblance of upside at tight end for the first time in years. 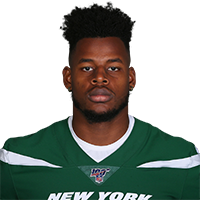 Herndon made his professional debut in Friday's 22-16 preseason loss to the Giants, failing to haul in his lone target. Analysis: An undisclosed injury had kept Herndon out of the first two preseason games, but the rookie fourth-rounder from Miami saw plenty of run here with 25 offensive snaps and 12 more on special teams. He failed to come up with a difficult catch along the sideline on his lone target, but Herndon's receiving skills were otherwise left untested. New York's starting tight end spot remains up for grabs with the regular season fast approaching. Herndon (undisclosed) isn't expected to play in Thursday's preseason contest against the Redskins, Rich Cimini of ESPN.com reports. 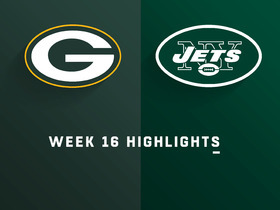 Analysis: Herndon sat out the Jets' exhibition opener last week after getting banged up in a practice leading up to the game. It appears the rookie tight end still hasn't made a full recovery, so he looks poised to again miss out on some valuable reps as he looks to build his case for a starting role over Jordan Leggett. Herndon sat out Friday's preseason opening victory over the Falcons after getting "banged up" at practice, Andy Vasquez of The Bergen Record reports. Analysis: It sounds like Herndon may be dealing with the accumulation of a few minor injuries, none of which has stopped him from making a good impression through two weeks of training camp. With no clear starting tight end on the Jets' roster, the rookie fourth-round pick is competing for snaps with Jordan Leggett (undisclosed), Eric Tomlinson, Clive Walford and Neal Sterling (ankle). Herndon continues to earn praise from Manish Mehta of the New York Daily News. Mehta believes Herndon will be the Jets' most productive tight end this season and for years to come. Analysis: New York's tight end position has been a black hole for years, but the team may have finally found an answer in Herndon. Playing in Miami's pro-style offense has helped the rookie fourth-rounder with his transition to the NFL, and the surgically repaired knee that may have caused him to drop on draft day has looked completely healthy thus far in camp. If Herndon has a strong preseason, he could wind up starting in Week 1. 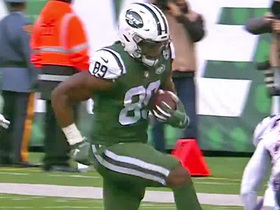 Herndon is a candidate to open the season as the Jets' top tight end, Manish Mehta of the New York Daily News reports. Analysis: Mehta highlights Herndon's ability in the slot, where his 81.4 percent catch rate led all FBS tight ends last season. Jets general manager Mike Maccagnan called Herndon a "dual guy" who could both block effectively and catch passes. While Herndon could be subject to league discipline due to his June DWI arrest, the case may end up delayed long enough to push any potential punishment off until 2019. He'll face competition for the No. 1 role in training camp from Jordan Leggett and Clive Walford.